There are some that adhere to the bigger is better philosophy, which infers that moving up into a larger segment somehow buys you a more appealing vehicle. I couldn’t agree less. Certainly this is true within most brands. The Range Rover Sport is a worthwhile jump up from this Evoque, and the full-size Range Rover is as over-the-top impressive as SUVs get, especially in top-line Supercharged Autobiography trim, but few of its direct peers or larger competitors match the little Evoque for driving dynamics. The Evoque starts with a turbocharged 2.0-litre four-cylinder that puts out an energetic 240 horsepower and 250 lb-ft of torque and comes mated to a class-leading adaptive shift program enhanced nine-speed automatic, controlled by a beautifully detailed knurled metal rotating dial selector that actually powers up from its otherwise flush resting place after ignition. After driving it for the first time last year I found it to be much more engaging than the old six-speed unit that came before, although this year’s slightly massaged version is considerably smoother and more refined feeling. While fuel-efficient at a claimed 11.3 L/100km city, 7.9 highway and 9.7 combined, this is the most powerful base engine in the Evoque’s class resulting in a 7.6-second sprint from zero to 100km/h and a top speed of 217 km/h. The Evoque also comes standard with an advanced four-wheel drive system that’s even capable of serious off-roading. Half of its key competitors offer cheaper front-wheel drive versions in base trim, although even when upgraded to AWD and including those that come standard with four-wheel propulsion, none offers anything near the Evoque’s 4x4 prowess. I’m guessing most Evoque owners won’t be trudging through waist deep swampland or mud-slinging their pretty little ride up the side of a mountain during spring runoff, or for that matter rock crawling through dry riverbeds in the heat of summer (search “Evoque off road extreme” for some incredible video footage), but they may find themselves knee-high in fluffy white stuff after a weekend on the slopes, at which point they’ll be glad they spent extra for a real off-road capable SUV. For such situations the 2016 Evoque’s Terrain Response system, which features pushbutton mode selection from normal to grass/gravel/snow, mud and ruts, or sand, has been upgraded with new All-Terrain Progress Control (ATPC) that maintains a driver selectable (via cruise control) speed of 1.8 to 30 km/h in either forward or reverse. This lets the driver solely focus on steering through difficult obstacles, rather than have to modulate the throttle too. It reminds me of the original Landy’s choke/accelerator linkage that could be used to do likewise, although this is light years more sophisticated. The most impressive aspect to all this capability is the juxtaposing brilliance of the Evoque’s on-road manners. You’d think the segment’s best off-roader would be the least capable on a narrow strip of two-lane tarmac, but the opposite is true. The Evoque’s adaptive suspension, brake-induced torque vectoring, wide rubber, and generally good mechanical dynamics, not to mention its relatively light 1,670-kilo curb weight thanks to prodigious use of high-strength steel throughout, aluminum for the hood and roof panels, plus polymer and composites for the front fenders and tailgate, give it an edge when the road starts to wind, while also providing a superb ride. In the same way the Evoque comes to market with a more powerful yet equally efficient powertrain and an advanced four-wheel drivetrain, the base model doesn’t skimp on features. Land Rover knows its Range Rover customers wouldn’t want an Evoque without large 18-inch alloy wheels, power-folding heatable side mirrors (the Evoque’s even include projected LED puddle lamps that graphically outline its body image on the ground below), satin aluminum treadplates, pushbutton ignition, LED interior lighting, a heatable leather-wrapped steering wheel, paddle shifters, rain-sensing wipers, a colour multi-information display, heatable 12-way powered front seats with four-way lumbar, grained leather upholstery, real aluminum inlays, a garage door opener, an auto-dimming rearview mirror, front and rear parking sensors, a backup camera (featuring trailer hitching guidance), dual-zone auto HVAC, eight-inch high-resolution colour infotainment with the latest smartphone-style pinch and swipe capability and access to popular smartphone apps, 380-watt 11-speaker Meridian surround-sound audio with Bluetooth streaming, a panoramic moonroof with a powered blind, carpeted mats with edging, and the list goes on and on, so it makes all these features and plenty more standard. 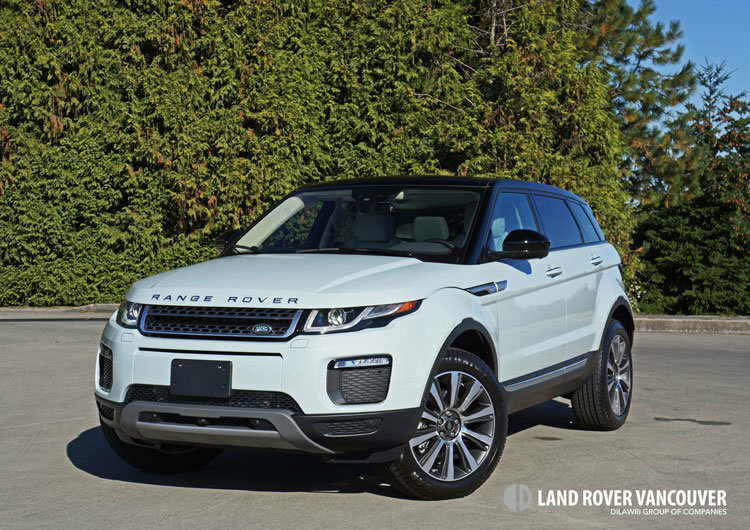 Add these items to most competitors and you’ll be right in the same range as the base Evoque’s $49,990 starting price, without the gorgeous styling, on and off-road performance, and prestigious cachet. My tester was upgraded to second-rung $57,490 HSE trim, which meant its standard features included 19-inch 10-spoke alloys, HID headlamps with signature LEDs plus auto-leveling and auto high beams, LED fog lamps, keyless access with the benefit of a hands-free Gesture Tailgate that simply needs a wave of the foot under the rear bumper to open, unique chrome treadplates, dark grey oak hardwood veneer (traditional brown hardwood is available), memory seats and side mirrors, the latter with reverse tilt, upgraded Oxford leather with perforated inserts, configurable mood lighting, larger 10.2-inch InControl Touch Plus infotainment with navigation, and more. My loaner came with some nice options too, the most noticeable being its wonderful Baltoro Ice exterior paint with contrasting Santorini black mirror caps, roof pillars, roof top, and spoiler. A light-greyish white Lunar Cirrus motif brightened the interior, while its upgrades continued with a sensational 825-watt 17-speaker Meridian audio system, and an Advanced Driver Assistance package featuring traffic sign recognition, a brilliantly sharp 360-degree surround camera with park distance control, blindspot monitoring with closing vehicle sensing and reverse cross-traffic alert, autonomous braking, lane keeping assist, attention assist, and automated parking assist for parallel parking, parking exit, and perpendicular parking. There were still options available such as new full LED headlights with adaptive cornering and auto high beams, a new head up display unit, cooled front seats, etcetera, plus there are two trim levels above HSE, including HSE Dynamic and Autobiography that increase content further while modifying the Evoque’s styling with a unique front fascia and more. Now that we’re talking styling, the Evoque remains the most ideally proportioned and arguably best looking compact SUV on the market, and now even better with the many visual updates made to this 2016 version. These include a revised grille, larger air intakes, new available “slimline” fog lamps, redesigned headlights, the old coupe model’s hood vents added to the two top-line models (the coupe has been replaced by the new convertible), a new rooftop spoiler with a wider CHMSL, and a new rooftop antenna, while the updated interior gets beautifully sculpted, wonderfully comfortable new seat designs, updated door panels, more soft-touch materials, new optional colour combinations, the aforementioned upgraded infotainment, new massaging front seats in top-line models, and much more. As for that interior, it continues to please with impressive style and quality. Unlike some competitors, all roof pillars are fabric-wrapped, the dash top and instrument panel isn’t only soft touch but stitched leather, all of the beautifully detailed aluminum trim is genuine, and the switchgear quality is excellent. While it’s closer to a subcompact SUV than the average compact, it’s quite roomy thanks to considerably more width than its competitors. Even if you’re larger than average you should have no problem fitting into the Evoque, as it’s headroom, legroom, plus shoulder and hip space is excellent for the class. The rear offers three-abreast seating for adults and ultra-comfortable accommodations for two, enhanced by a flip-down centre armrest filled with cupholders. The cargo compartment is also nicely finished, with carpeting on the floor and sidewalls, mine upgraded with a rubber tray for protecting those carpets from wet things like skis, ski boots and outerwear, while a stainless trunk sill protector plate and chromed tie-down rings improve the look and functionality. The rear seatbacks split 60/40 and fold quite flat, while like the passenger compartment this model provides greater size for more cargo capacity than some of its rivals; the numbers reading 575 litres with the rear seatbacks upright and 1,445 litres when laid flat. A hard tonneau cover is standard, providing visual protection from prying eyes as well as a sturdy parcel shelf for lighter items. Spend a little time with an Evoque and you’ll quickly appreciate how it managed to notch up more than 165 international awards since inception. This is a superb little SUV that keeps on getting better, even if the changes seem incremental. I recommend it very highly.